Insomnia is a frustrating and often debilitating condition as sleep deprivation can cause nonproductive, general fatigue and a weakened immune system. The main cause of Insomnia is often anxiety, stress and/or mismanaged psychological factors. 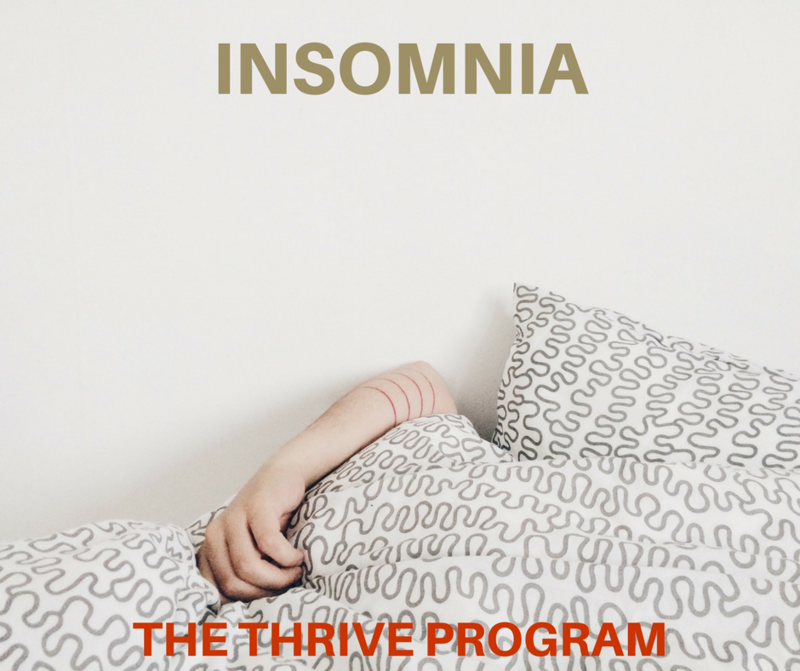 The THRIVE Programme is a research and evidence based training program that teaches you the underlying causes of your insomnia and how to resolve the psycological factors behind them. These include but are not limites to your beliefs, self-esteem, thinking styles, social anxiety and personality. THRIVE is a 6 week programme where we work through these psychological factors and resolve them along the way. 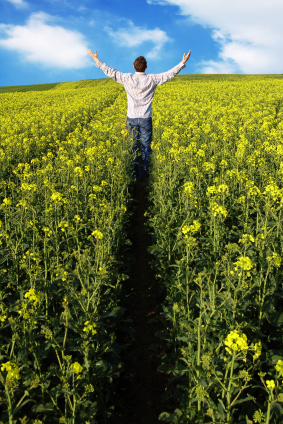 When you are free from stress, worry and feeling in control sleep no longer becomes an issue. After all anxiety and sleep never mix well as you are prone to always being in a heightened state of mind. View progamme layout here. To achieve permanent results we need to help you gain insight into how your insomnia was created or maintained in the first place. THRIVE is one of the best and most successful programmes in the world at teaching you the root causes your insomnia and its related symptoms. There are a variety of different mechanisms in place that cause a person to create anxiety. Amongst them are self-esteem, social anxiety, your beliefs, thinking styles, character traits, etc. THRIVE is an evidence based psychological training program that offers you a permanent resolution to your problems, letting you live a life free from the psychological factors that are maintaining your symptoms. Other therapies including CBT, psychotherapy, EFT, NLP only ever deal with the symptoms, leaving the root causes to manifest elsewhere. Why control your problem when you can rid yourself of it once and for all. I had been struggling with insomnia and anxiety for a few months until I came across the Thrive Programme and set up an appointment to meet with Daniel. That was the beginning of a life-altering process for me. Daniel was so comfortable to talk to and the workbook was well laid out and easy to follow. The simple steps led me to realize that all of my negative thinking was not serving me and although it required work to change my mindset, it all happened in a relatively short period of time. Before I met Claire sleeping was a real issue for me, I was finding it increasingly difficult to drift off at night and I had tried a number of well-known remedies but none had worked. After just one session with Claire on the Thrive program I noticed a change and after completing the course I can honestly say things are dramatically different, not only with my sleeping, but also in the way I think, and I would whole heartedly recommend Claire and the Thrive programme to anyone! My mum suggested contacting Claire and when we talked it through with her she explained why she thought the Thrive program would be best for me. I got started on the workbook and over a course of around 6 weeks I completed all the reading and activities in the book, along with my sessions with Claire. Over just this short period of time not only did my sleeping vastly improve, but my self-esteem grew, I had a lot less social anxiety and I was generally a lot happier, more positive and felt more in control of my own life. Claire made me feel instantly at ease and her warm, welcoming personality made the sessions enjoyable as well as helpful and informative. 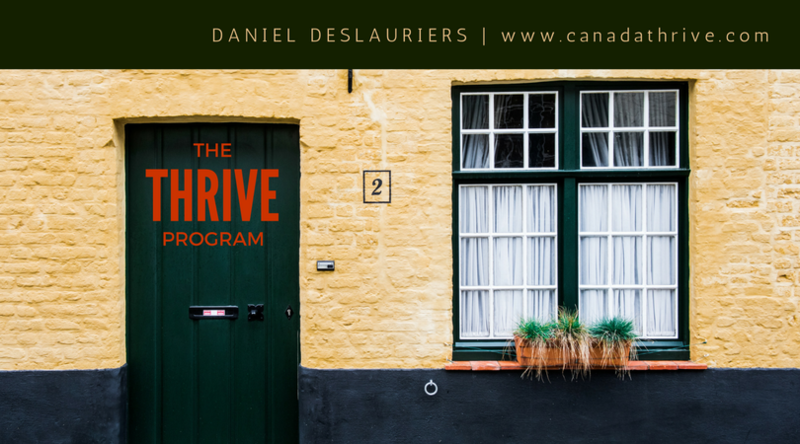 The Thrive program sets things out in a way which is easy to understand, so although at times it can be challenging, it doesn’t seem too daunting and unachievable. Going through the book with Claire helped no end as she could help me when I became stuck on certain sections of the book, and she encouraged me throughout to continue with putting what the programme teaches into practice! I have noticed a big change in myself since starting Thrive with Claire, and I know these changes will not be short lived. I am incredibly thankful to both Claire and the Thrive program for what they have done for me, and I am thrilled to say that I now have a ‘Thrive attitude’! I went to Stephen as I had suffered from anxiety and sleeplessness since I suffered an anaphylactic shock a few months earlier, I feared that it could happen again and that this time it would be fatal. This would be highly unlikely as I was allergic to a drug that was only given as part of an anaesthetic, however it had a profound effect on me as I almost died, making me question my entire life and leaving me feeling totally out of control. Stephen really put me at ease in our first meeting, and I had every confidence that he would be able to help me get back to normal. He recommended the ‘Thrive’ programme and as we were working through it I learned that I also had very low self-esteem and self-confidence, issues that had held me back over the years but that I had never really addressed as being a ‘problem’. At the end of the programme I felt much more confident and in control, able to sleep well at night without sleeping tablets and was also able to stop the anti-depressants I had been on for years. I am no longer scared to voice my opinion or stick up for myself, which in turn has actually led me to have much better relationships with my husband, friends, family and work colleagues. My self esteem has also greatly improved, with everyone noticing the change in me, this new found confidence has led me to accept a more challenging (yet more rewarding) role in my work, which I would have otherwise turned down, thinking myself ‘not up to it’. I will be eternally grateful to Stephen for helping me to change my life, and would recommend anyone with self-esteem or confidence issues to give the ‘Thrive’ programme a go. I thought as soon as I walked out today I should of given you some sort of testimonial as I’ve found the whole experience really positive, hence why I have now sent 3 referalls through to you also. Please feel free to put ‘as a busy company owner trying to deal with bouts of what I would class as serious depression. It finally took its toll earlier this year. My Doctor advised the usually medication and suggested that it would be better for me to be taking a small dose forever rather than constantly trying to give them up. Although incredibly low I could not bear to take the pills and after some online research called Jon. After just one session I could see a small amount of light (enough to last another week anyway) and returned for weekly sessions to work through the Thrive programme. In Just three weeks I was not only free from depression but actively losing weight and feeling the best I had in as long as I can remember. I have since recommended other people to the programme and can honestly say my daily life’s not only easier but actually so much more enjoyable. I never realised I did not sleep through the night until I actually started sleeping through.I am often very sceptical about alternate therapies / treatments, however this was the best things Ive done with my life in years. Im now confident and happy. I realise now that for over 3 years I had been making myself depressed. I was taking anti-depressant medication and sleeping pills and I felt fluffy and foggy for a lot of the time. Then my mum died and things just got worse. I went to work, came home and couldn’t wait to go to bed, just to get the day over with. I realised I was getting through life, not living it. I needed help, that’s when I turned to Derek a Thrive Consultant. He was great, he explained The Thrive Programme to me and how he would help me to help myself, so I signed up. After a couple of sessions I felt less helpless and I could feel I was getting control of my life back. I looked forward to and enjoyed the sessions, there were times though when I really had to challenge myself and face up to uncomfortable realities but is was the realisation that I was responsible for the way I thought and felt that was an important part of me making the changes. After a while I stopped taking the sleeping tablets and had my first natural, real nights sleep in years. I completed the six sessions with Derek and shortly afterwards spoke to my GP about gradually coming off the anti-depressants as I felt I no longer needed them. Now, one year down the line I am doing really well, I am drug free and looking into giving up my job and retraining, I have such a zest for life now. I do sometimes have a low moment but I remember what I have learnt and can soon turn it around. At the moment I’m going through a sad period as my father is dying but because I have done Thrive I now have the knowledge and tools to know I will cope with this and come out the other side. I have achieved a lot. Well done me! Having experienced almost persistent insomnia over nearly forty years and failing to respond positively to six widely varying types of intervention, I read Rob Kelly’s website with interest. Following initial contact, I had five sessions with Rob. Before and throughout these sessions, I used his book ‘Changing Limiting Beliefs’. It is set out clearly, whether text (I appreciated the occasional humour), quiz or diagram and its content was a great contributor in changing my limiting beliefs. As a result, I now sleep soundly – a new experience and one to cherish. In addition, my social confidence and self-belief have improved beyond measure. So, thank you Rob for your help, you perception and, of course, ‘Changing Limiting Beliefs’. After spending years suffering from insomnia, anxiety attacks and general self-esteem issues yet frequent doctors visits to no-avail. I decided to put destiny in my own hands and started to research the psychological reasoning behind why I was the way I was. Since then, I’ve read numerous self help or even text books on Cognitive Behavioural Therapy (CBT) and Neuro-Linguistic Programming (NLP) and understood the concepts of self-efficacy and behavioural models but still found it very difficult to actually put this theory in to practice. I found the unique approach taken by Rob Kelly in this book excellent, by slowly easing you in to a different mindset. Step by step, in an easily readable yet not dumbed down manner, he helps you to question your own internal values and beliefs and very clearly shows you where your limiting factors are. Once these are identified, he demonstrates how to change your internal thinking to overcome your issues. This book not only has helped with the above problems but it has also helped in all areas of my life; and the beauty of it is you can re-read and repeat the tests at a later date to see how you have developed and what still needs developing. Great book, thanks Rob Kelly for writing it and Amy Smith for recommending and guiding me through it! When I began the thrive programme I was experiencing many difficulties at home and was in a continual cycle of feeling low, not achieving any goals and feeling deeply frustrated with my life. The stress and frustration had manifested in physical symptoms of insomnia and bouts of crying and feeling desperately out of control. I can now say, hand on heart, that the thrive programme has given me the tools to lift myself out of that cycle – i have regained a self confidence i had forgotten existed and learnt so much about myself which has given me a new awareness and strength to sort out any situations i feel out of control of . I highly recommend Clare and the programme – she is enthusiastic about her work and extremely competent and has helped me help myself to get back to feeling positive and happy about my world. i can whole heartedly recommend the programme. We are all taught how to have healthy bodies but no one has ever educated us how to keep our minds healthy so step out of your comfort zone and take your first step to feeling good and sign up!